​How often should you weigh yourself for weight loss is such a loaded question because it depends on a variety of factors, including how stepping on the scale makes you feel. For some people, stepping on the scale triggers way too many emotions. They won’t even step on the scale because they just don’t want to know the number. On the flip side, some people weigh themselves every day. If stepping on the scale doesn’t trigger you, consider weighing yourself either once a week or once every two weeks. Look for a pattern of loss over several weeks. The best time to weigh yourself is first thing in the morning, always under the same conditions (clothes/no clothes) and with the scale in the same spot. See: How Do I Lose I Weight? Before deciding whether to weigh yourself as a way to track your weight loss, there are a few things to ask yourself. Should I Weigh Myself at All? 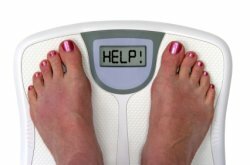 As a weight loss coach, what do I recommend when it comes to weighing yourself? I recommend using the scale like any other weight loss tool: if it helps you, use it; if it doesn’t help you, ditch it. If getting on the scale causes you pain, anxiety, frustration, knocks you off track, discourages you, then stay off the scale and use other ways to track your progress. See the last two ways in my blog post, "4 Ways to Track Your Weight Loss Progress." You absolutely don’t need to use the scale to lose weight. 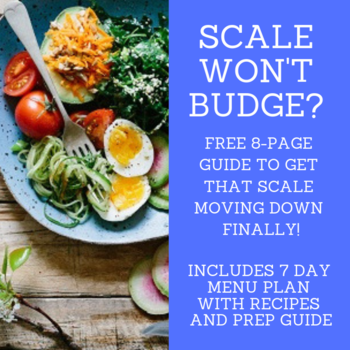 But, if you get on the scale with your scientist hat on and can look at the number with a fascination -- with the understanding that weight fluctuates -- then you can use the scale as a tool to help you track your weight loss and to help you to decide whether you need to make adjustments to your food and exercise habits. On average, every two weeks is a good time interval (it’s what I do with my one-on-one weight loss coaching clients -- and that’s ONLY if they want to do a weigh-in). What you need to look for is a gradual decline in weight over several weeks. You look for a pattern. How Often Should I Weigh Myself - Daily or Weekly? Less Often? Again, it all depends on how it makes you feel. I find it motivating to weigh myself (almost) every day. There’s a fascination there, in a scientific way. I observe and note things without emotion. And if, for some reason, I know it won’t make me feel good, I skip the weigh-in. No big deal. Years ago, though, that wouldn’t have been the situation. Stepping on the scale and seeing the same number -- or see the number go up -- would have made me feel discouraged and frustrated because I didn’t understand how -- and why -- weight fluctuates. Stepping on the scale is a personal thing. Let’s look at some pros and cons for weighing yourself daily vs. weekly. According to the National Weight Control Registry, 44% of their members who have lost 30lbs or more and kept it off for more than a year weigh themselves daily. And generally, 38% of their members weigh themselves daily while 78% weigh themselves at least weekly. At first glance, weighing yourself daily seems like a good idea, right? You’d see right away if you gained or lost weight from how you ate and exercised the day before. You’d be able to see whether you’re on track or not. And for many, this is true. The problem with daily weigh-ins is your weight fluctuates each day for a variety of reasons. For some people, it can be discouraging to see this weight fluctuation. You “eat well” the day before, do your work out, and then step on the scale the next day and see… that you’ve gained a pound! If you weigh yourself daily, keep in mind that if the scale shows a jump of a pound or two, it’s highly unlikely it’s all “fat” you gained. To gain a pound or two of fat in a day, you’d have to consume over 3500 to 7000 calories more than you burn in a day. Weigh yourself at the same time of day and in under the same conditions. You ate more carbs than usual so you’ve retained water (1 gram carbs holds on to about 3 grams of water. You ate later in the day than you usually do. You aren’t weighing yourself under the same circumstances (with clothes on, after breakfast instead of before, you’re PMS’ing, for example). You gained a bit of muscle (yup, it could happen). And if you’re going to weigh yourself daily, get a digital bathroom scale that measures your weight in 0.1 lb (or 50 gram) increments. Consider getting a scale which also measures your body fat percentage. While they’re not as accurate as the more expensive hydrostatic weighing, it can still give you an idea of your body composition. And that’s what we really should be aiming for: changing the composition of our body by losing body fat and gaining muscle. Weekly weigh-ins may be more motivating because you wouldn’t see the daily fluctuations. Instead you’d see a weekly trend of weight loss or weight gain and you could make changes in your eating or exercise, if needed. You’d weigh yourself the same way as you would for daily weigh-ins: same time of the day and under the same circumstances. Same for bi-weekly weigh-ins. What I like about bi-weekly weigh-ins is it can take the focus off of weight for a couple of weeks and let you focus on becoming consistent with your nutrition and exercise habits. 1) Decide on how often you’re going to weigh yourself, whether it’s daily, weekly or bi-weekly. 3) Take your starting weight and record it somewhere (FitWatch Fitness Tracker, some other tracker, your favorite weight app.) Make either a real or mental note of the conditions: clothes/no clothes, time of day, empty or full stomach, how much and what you ate the night before). 4) Repeat steps 1 through 3 either daily, weekly or biweekly and keep track of the number. 5) After about four to six weeks, schedule a little meeting with yourself to sit down and look at the numbers. Are you seeing a pattern of loss? Are you gaining weight? Still the same? Make adjustment to your food and exercise habits, if need be. You may need to create more of a calorie deficit in order to lose weight. To really get an idea of how you’re doing with weight loss, take into consideration your body fat percentage over the weeks, as well as your measurements. The scale measures overall weight and might not be telling the whole story. You may be losing fat but gaining a bit of muscle. You might look down at the scale and not see a difference in number, but your body fat percentage might be lower (meaning you lost FAT! Whoohoo!) Or you might have gained a bit of “weight” but not realize it’s muscle; not fat. Which is what you want to aim for, right? You can use my body fat percentage calculator to calculate your BF% or, as I mentioned above, get a scale that calculates your body fat % for you every time you weigh in. Taking before and after photos is not for everybody, that’s for sure. If it triggers you in any way, don’t do it. I recommend taking pictures for a couple of reasons: you’ll be able to objectively see the difference when you DO lose weight; you will LOVE to be able to look back on these pics to see how far you’ve come. Bottom line, it’s up to you how often to weigh yourself and if you’re going to weigh yourself at all. Don’t sabotage yourself by focusing too much on weight. Other things to take into consideration can be: How you feel about yourself, how much energy you have, whether things like your blood pressure, cholesterol or blood sugar levels are better. The key to losing weight is to become consistent with your food and exercise habits. The scale just helps to show your progress and can help keep you on your toes. It’s just one tool of many to help you stay on track. And remember, you’re more than just a number on a scale! How Many Calories are Burned Shoveling Snow?